How much does it cost to travel to Pingyao? How much money will you need in Pingyao? ¥98 ($15) is the average daily price for traveling in Pingyao. The average price of food for one day is ¥45 ($6.68). The average price of a hotel for a couple is ¥88 ($13). Additional pricing is in the table below. These average travel prices have been collected from other travelers to help you plan your own travel budget. How much money do I need for Pingyao? Pingyao is a small city in the Shanxi Province of China, dating back over 2700 years. The city is most famous for their old town, which is listed as a UNESCO World Heritage Site. The old town is one of the best preserved ancient walled cities in the world dating back to the Ming and Qing Dynasties. The climate in Pingyao is influenced by monsoons, and therefore gets hot and humid summers and chillier springs. Autumn is a great time to visit as temperatures are fairly mild-in the 50-60's Fahrenheit- and you can avoid the heavy rains of summer. Winter is also a pleasant time to visit, especially since temperatures tend not to dip below 30 and there is not much snow or bad weather. The best sight in Pingyao is actually the city itself! The Old Town, which takes up just one mile, is the ancient walled area of the over 2700-year-old town. The cobbled streets and old buildings are mostly original, dating back to the Ming and Qing Dynasties in the 1360's. There are over 30 buildings and other attractions to explore within the walled city, which is why the city offers a tourist pass for a flat fee so you can see it all. Outside of the Old Town is the Rishengchang Exchange House, built in 1823, it is one of the oldest bank buildings in the country. The bank itself was shut down in the 1930's, but the building itself is still worth exploring. Next, head to Yamen, the county government compound built in the 1340's. The compound itself boasts over 300 rooms and you'll find everything from a prison, courtrooms, residential areas, a garden, and a ceremonial gate. Then, there is Ming-Qing Street, so named for the Ming and Qing Dynasties that built many of the buildings you'll see there. Even some of the shops from those eras are still open as well as some courtyard houses which you can explore. Pingyao is a very small city, divided up mostly between the walled area of Old Town and the area around Old Town. There are a few restaurants and accommodations outside of the gates into the Old Town. Outside of Pingyao is the capital city of the Shanxi Province, Taiyuan. Taiyuan is a popular option for people doing day trips to Pingyao since there are multiple companies who offer scheduled day trips from Taiyuan to Pingyao. Another nice place for a day trip from Pingyao is Yuncheng, where you'll find the famous Yongle Palace and Guan Di Temple. The palace is known for their Yuan Dynasty murals which are considered some of the best artistic treasures in China. On Ming-Qing Street is the City Tower, the tallest building in the city. Climb up the steps and get gorgeous views of the city, which make the climb well worth it! For more stunning views, take a walk on top of the city walls. 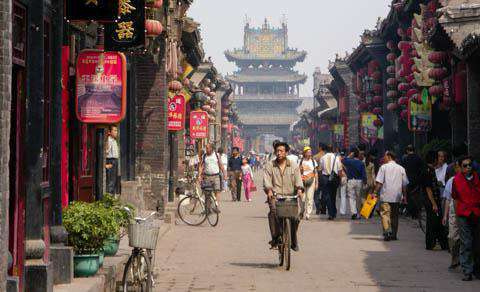 The path takes you on a circuit around the city and is included with the Pingyao tourist pass. Pingyao hosts a beautiful Lantern Festival during the eighth month of the lunar new year, which is usually in September. During the festival, you'll find the city adorned with bright red lanterns and there's a huge parade to celebrate. The Shehuo Festival, or Spring Festival, celebrates the Chinese New Year. The streets come alive with Shehuo performers who perform traditional folk dances and performers who play traditional drums and gongs. Pingyao is famous for Pingyao Beef, which is served as cold beef that that is sliced much like ham and has an almost corned beef flavor. It is common for tourists to be charged twice the price for Pingyao Beef, so always be sure to ask the price before placing your order. Restaurants inside the Old Town walls tend to be tourist traps, with high prices and low quality food. Outside of the West Gate, you'll find some of the best restaurants, including Petit Resto-also called De Ju Yuan-, which has options for every palate. There are not many bars or nightclubs in the area. You'll find mostly relaxed, pub-like, bars where you can enjoy a beer usually up until midnight. There is no local airport, although trains and buses are plentiful and you can easily access the city from the stations. You can also taxi from major cities, like Taiyuan, for fairly cheap. Walking is by far best option, especially since the majority of tourist attractions are within the one-mile radius of the Old Town. If you are traveling outside of Old Town, there are plenty of taxis that are on the cheap side. As always, ask for the meter to be turned on instead of negotiating a price, this will help you avoid any confusion. Definitely rent a bike for a day while you're in Pingyao. This is the best way to get out of town and explore the area. The bikes are in descent condition, but confirm it's quality before you leave. Everyone recommends you head to a temple a few kilometers out of town. You head out on a busy road, but eventually end up in the countryside. The temple itself is quite nice, but even more interesting is venturing on your own further into the countryside. There are lots of nearby small towns and you'll feel like you stepped back in time. Many have markets that are fun to wander through.